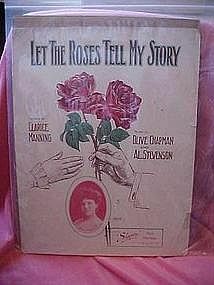 Very old sheet music from 1909. Cover art by Starmer and photo inset of Ruby Bridge. Words by Clarice Manning, music by Olive Chapman and Al. Stevenson. Poor condition but all pages are there, and playable. Would be pretty framed as a nice sentiment.